The California Statement and Designation by Foreign Corporation | S&DC-S/N must be filed by foreign entities wishing to open and operate a corporation in the State of California. This will require documents from various entities so one should make sure they are aware of current laws in both California as well as the origin state of the entity forming the California corporation. 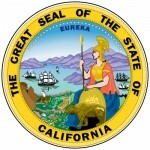 In order to file properly the minimum submittal requirements will call for the original and completed California statement, a Certificate of Good Standing from the origin state (dated within six months of filing these articles), all required supporting documents, and a payment for all appropriate fees. If forming a For-Profit Corporation, the filing fee will be $100.00. If filing for a Non-Profit Corporation, the filing fee will be $30.00. It is important to note, that if filing a Non-Profit foreign corporation in the State of California then the Certificate of Good Standing being submitted from the origin state must note the corporation is a nonprofit or non-stock corporation. Step 1 -In “Corporate Name,” you must list the name of your corporation exactly as it appears on the Certificate of Good Standing obtained in it’s origin state on the lines provided next to Item 1. In some cases, the original corporate name may be unavailable or noncompliant with state laws in California. In such cases, report the name that your corporation will assume in this state. You may use phrasing such as “The exact name of the corporation is [corporate name as shown on Certificate of Good Standing from origin state] and will do business in California as [assumed name your corporation will operate under in the State of California]. Step 2 - In the “Corporate History” section, report the origin state or foreign country of your corporation. That is, where this corporation formed by submitting its first Articles of Incorporation. Step 3 - The “Service of Process” section will be where you list the registered corporate agent who is authorized to receive court documents in the event this entity is sued. This agent must be of adult age, must maintain an address within the State of California, and may not be your own corporation. Report the full name of the registered corporate agent in Item 3a then, if this agent is previously unregistered, enter his/her address in Item 3b. Item 3b will not allow for a Post Office Box address, it must be a physical street address. Step 4 - In the “Corporate Addresses” section you will need to report several facts. In item 4a, report the address of the Principal Executive Office (Street Address, City, State, and Zip Code). In Item 4b, list the full address of the Principal Office in California (Street Address, City, Zip Code). Finally, in Item 4c, you may report the full address of the Principal Executive Office if it differs from Item 4a and 4b. Step 5 - There will be enough room at the bottom of this document for one Incorporator to sign and print his/her name. 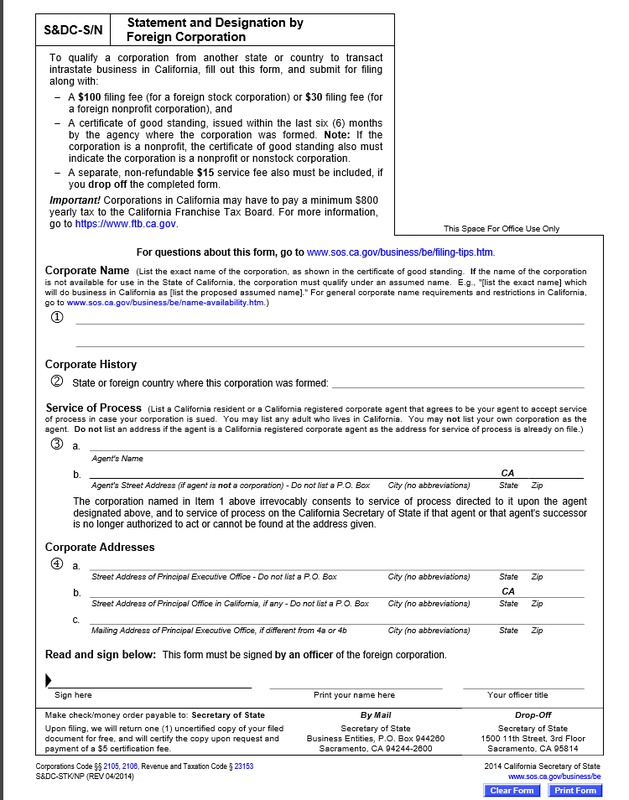 This section requires that any officer of the foreign corporation authorized by that corporation to submit this document provide his/her signed and printed name. Step 6 - Once you have obtained all the necessary paperwork and verified the information presented in this document you may submit it to the California Secretary of State with payment of required fees. If this is a For-Profit Corporation, the filing fee is $100.00. For an additional $5.00 you may obtain a certified copy of the submitted statement upon request and payment. If this is a nonprofit corporation the filing fee will be $30.00 (with the option of purchasing a certified copy for $5.00). If you submit this paperwork by dropping it off personally, you must include payment for an additional $15.00 service charge. 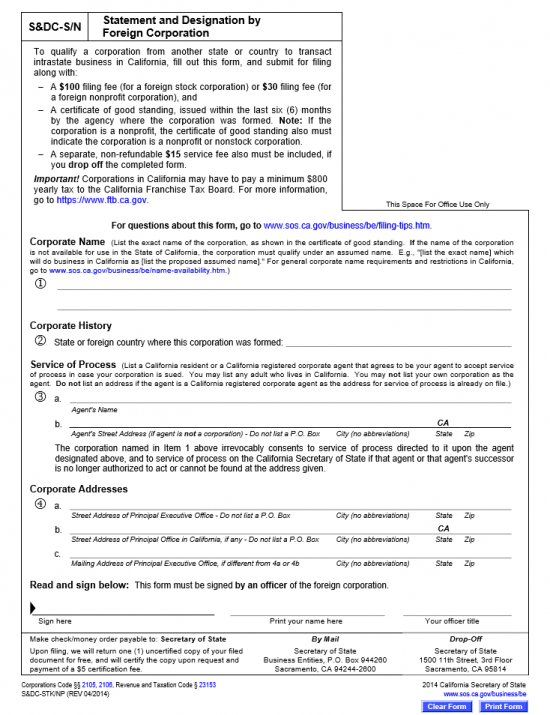 Step 7 - All foreign corporations that form in this state must submit Form SI-350 (Statement of Information) within 90 days of filing the California Statement and Designation by Foreign Corporation | Form S&DC-S/N. This may be done by mail or electronically. You may download the SI-350 here: Statement of Information. To electronically file visit: https://businessfilings.sos.ca.gov.